Paid HelpSite accounts can invite additional user accounts to so multiple team members can collaborate on a help site. Admin: Admin users can perform any action in HelpSite. This includes editing articles, site settings, billing settings, add/remove team members, etc. 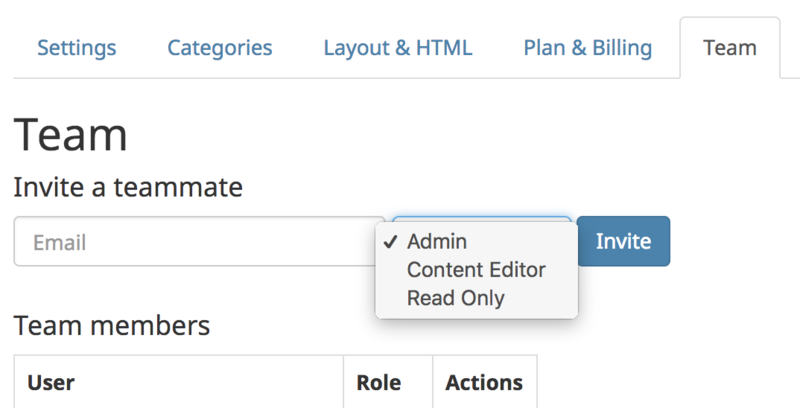 Content Editor: Content Editor users can create/edit/delete articles & categories. They can also view the public or private help site. They cannot change site settings, billing settings, nor invite other teammates. Read Only: Can only view the help site. Cannot view anything in the admin dashboard. This user type only makes sense to use if your site is setup as private/internal. For public sites, you can simply direct users to your help site's URL without creating a user account for them. To add or manage users in your account, click your name in the top right and then "Manage Team". Note: If you have more than one "site" within your HelpSite account, the users (and their roles) you invite apply to all sites in the account.